Front line troops who toil daily in the hospitality industry got their day in the sun during a kickoff lunch Thursday for National Travel & Tourism Week amid hopes of a banner year for Flagler County’s tourism business. Turner spoke before the annual Hospitality Employees Recognition of Excellent Service, or H.E.R.O.E.S., awards lunch at the Hammock Beach Resort. Thirty hospitality workers, in jobs from front desk clerks to food servers to a park ranger and dolphin trainer were nominated for the awards and attended the lunch. Five people won awards. Bed tax income did dip two months in late 2012, which Turner described as a statistical blip in an otherwise upward trend at least partly to blame on a slow Biketoberfest. The dip was not unexpected: several countries in Europe are in recession (and France is about to join them), reducing transatlantic traffic. In Flagler County, 2,600 people work in tourist businesses in jobs ranging from entry level clerk to administrative positions. “Tourism is a huge economic driver, not just for the state of Florida but for Flagler County,” said Rebecca DeLorenzo, president of the Flagler County Chamber of Commerce & Affiliates. Efforts by Hammock Beach Resort to enter into a marketing promotion as a Grand Golf Resort of Florida have been successful, she said. “The better Hammock Beach does, the better our area does, because they are the biggest property,” Turner said. A national trend for vacation home rentals has also helped. “We have those in abundance,” Turner said. “That is very, very popular for a family to come and stay in a variety of size homes.” The abundance has been such that it’s created conflicts in the Hammock between vacation renters and more permanent home-owners, triggering hopes of legislative intervention. Those hopes were dashed this year. Palm Coast’s efforts to boost tourism by attracting youth sports tournaments has had generated its own economic activity as youth participants and their parents stay in hotel rooms, eat in local restaurants, visit Flagler attractions and the beach. “The Tourist Development Council has hired a production development representative to work with niche marketing in sports, the arts and outdoors,” Turner said. “We’re really trying to pump up our efforts in the micro, or niche, markets. Sports have a huge potential to play in that. In addition to youth soccer and lacrosse tournaments, as state horseshoe tournament is planned in Flagler County in 2015. 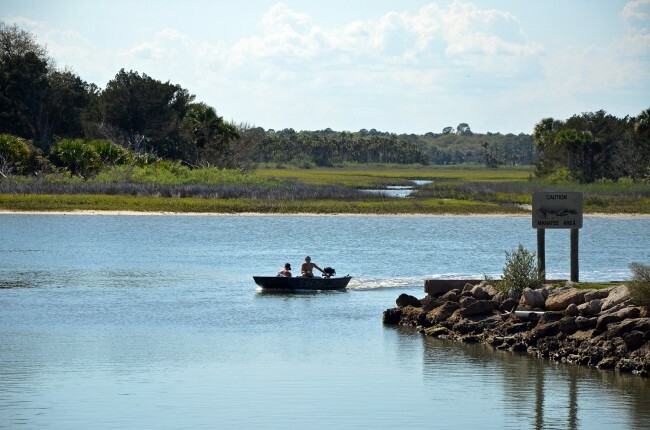 When it comes to outdoors tourism, Flagler County has a jewel in Gamble Rogers State Park. Barbara Roberts, park manager, led a quartet of park employees in olive park ranger uniforms to the luncheon, including Anthony Greaves, a park ranger selected as one of the five H.E.R.O.E.S. “Our campground is a very popular destination for local people, as well as people as far away as Canada,” Roberts said. “We even had some people from Europe who brought over their own motor home and stayed with us. Our campground has 97 percent occupancy, that’s the highest in the entire Florida State Park Service.” The park’s location so close to the beach (south of Flagler Beach) helps its popularity, as does being close to Flagler Beach, a quaint city not as developed as other coastal cities, she said. Activities offered at the park include kayak rentals and tours, full moon walks and low tide bicycle rides. Gamble Rogers State Park is also on the Great Florida Birding Trail. “Last week we had a state soccer tournament,” Crabb said. “It was a statewide event. You had people coming in from Miami, Orlando and Tampa. It’s a win-win for everyone. They stay at local hotels, eat at local restaurants, visit local attractions. “And it doesn’t hurt to have the Indian Trails Sports Complex,” Crabb said, “which is an immaculate facility maintained by the city of Palm Coast.” Crabb said there are 13 soccer tournaments planned this year in Palm Coast, double the number of tournaments in 2012. He also gave credit to a new marketing effort as he prepared for the awards ceremony, during which one of his employees, Kellie Scribner was selected as one of the five H.E.R.O.E.S. Three other H.E.R.O.E.S. 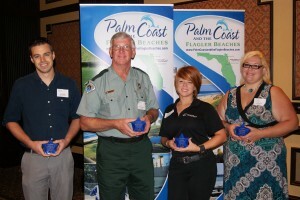 honored included Jason Olivares of Hammock Beach Resort, Sky Austin of Marineland Dolphin Adventure and Jason Hutsell, of the Flagler Fish Co., the Flagler Beach restaurant. Following is a list of the other 25 people nominated for the H.E.R.O.E.S. awards: Patrice Beecher, Rob Blackmore, Dewey Brown, Nicole Connon, Amanda Corcoran, Carol Giles, Liz Groundwater, Joe Hari, Eric Johnson, Shakiria Jones, Madeline Kinney, Laurie Mazzola, Craig Medvid, Brandon Millman, Curtis Moden, Al Rebelo, Mark Siembieda, Latisha Smith, Jackie VanMiddlesworth, Elena Vuscan and Joe Williams, all of Hammock Beach Resort; Barbara Manzer, Gamble Rogers State park; T.J. Musto, Hampton Inn & Suites; Dan Palmer and Danielle Salvatore, Marine Dolphin Adventure.